Bantry is one of the finest towns in all of Ireland. The fresh sea air carries you around the town, and the warm atmosphere created by friendly locals is just part of what makes people fall in love with Bantry. The innate local landscape is a treat for the senses, with superb views of the harbour and coast. The sumptuous rugged terrain that flows around Bantry is extraordinary. Located along the Wild Atlantic Way, Bantry Bay is a marvellous water space, with everything from kayaking to surfing and several other kinds of watersports. This West Cork town is a great spot for some fishing, with some of the most serene spaces in Ireland for casting your line out. West Cork has a tremendous amount of whale watching opportunities also. It is a far less strenuous water activity, but whale watching is still a captivating experience for all the family. There are a whole host of ways to enjoy yourself on land, too. The Drimoleague walkways provide a superb hill walking route. This former railway junction was converted into a series of trails that were launched in 2008. There are an abundance of routes to choose from, all of which will reveal West Cork’s natural beauty to you. With beaches, bays, bridges, rivers and lakes to be uncovered, you had better make sure you packed your walking boots. The perfect time for exploring Bantry on foot is surely during the walking festival, where people come from all over to celebrate these wonderful trails. The town is also home to a couple of fine golf courses, for those who prefer to bring their clubs along on their walk. 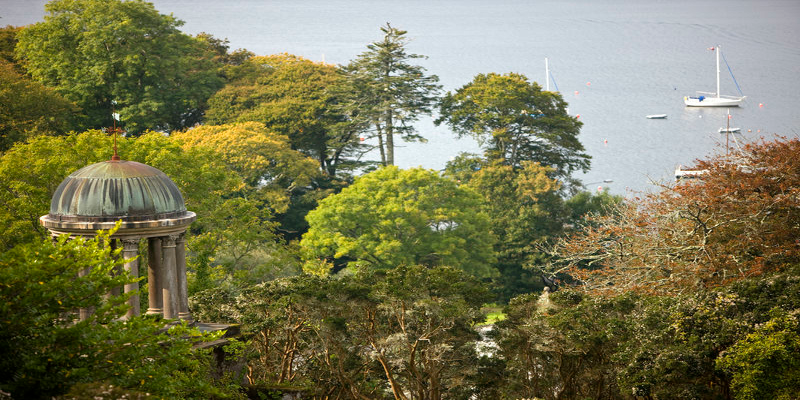 Bantry House is home to one of Ireland’s most exquisite garden grounds. The ambient surroundings create a relaxed atmosphere for visitors to explore the area in. The thick ivy climbs the house walls, and the combination of trees and planted flora and fauna make for a very enjoyable amble around. The panoramic sea views behind the house are a joy to behold. The house itself has a grand tradition and history, including operating as a hospital for five years during the Irish Civil War. The main streets of Bantry are littered with top quality and award-winning dining establishments, such as the Fish Kitchen and the Michelin star rated O’Connors seafood restaurant. You certainly won’t go hungry in Bantry, with the fresh locally sourced fish of the highest standards. There is also the famous Bantry Market, so whatever your dining needs, you will have plenty of options. Just make sure and eat well, because Bantry has so much worth seeing.